What’s Clive Palmer Really Like? 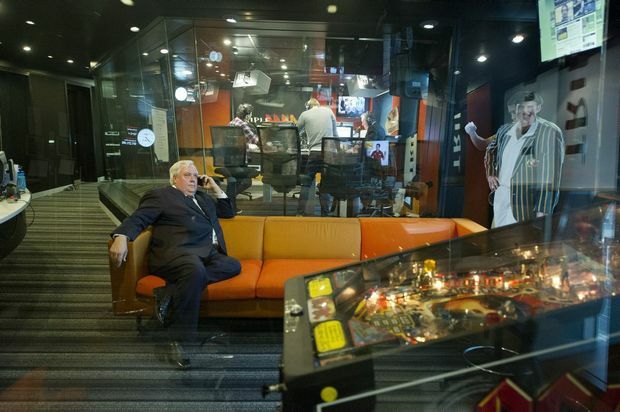 Regular readers will easily spot the key reasons why your humble blogger has — on taking a closer look — quickly warmed to our National Living Treasure, Clive Palmer. 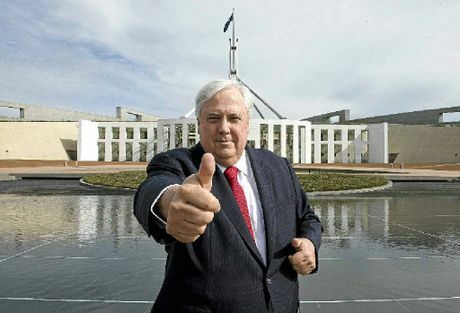 MAN ON THE MOVE: Palmer United Party leader Clive Palmer gestures outside Parliament as he waits to do a television interview in Canberra. NINE flights in a day. Six hours of sleep in three days. Four hours on a sleep machine for most of the others. 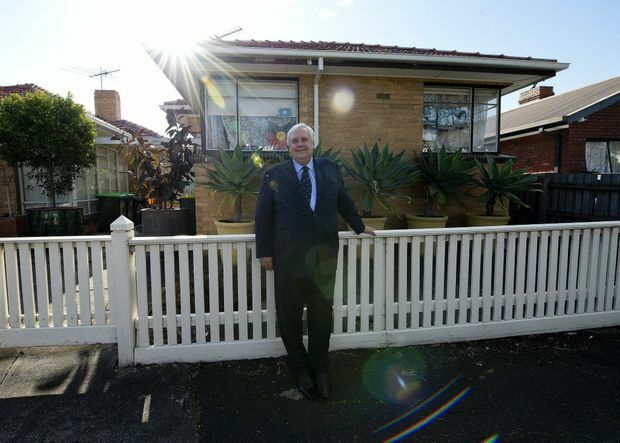 Welcome to the bizarre world of one of Australia’s most driven, sharp-minded and eccentric people, Clive Palmer. The human headline hunter is on a mission to turn Australian politics on its head, saying the major parties have failed Australians for too long. Twerking in a Sydney radio station, hanging up on an ABC interviewer, rehashing old allegations, or being involved in a plane fuel drama with federal police, Mr Palmer is determined to do anything to project his message out there. In one day, he did 10 radio and television interviews and two press conferences. The previous day he debated Bob Katter at the National Press Club before flying back to a two-hour forum in Nambour put on by the Australian Christian Lobby. Mr Palmer is brutal in his attacks on Kevin Rudd and Tony Abbott, labelling them boring, devoid of ideas, and puppets of Rupert Murdoch and Barack Obama. “I find it offensive that both major parties are not being run by Australians,” the mining magnate tells the ABC in Sydney. In Nambour, he projects a much softer image, talking of the importance of family, his children, and moral values as he seeks to woo churchgoers. Despite his success in business, we find Mr Palmer continually seeking assurance and endorsement from those around him. He often ends sentences with ‘Right?’ to make sure you’re on the journey with him. Mr Palmer is easy to get along with but you wouldn’t want to be on the wrong side of him. And as an MP he would be more of a talker than a listener. He relishes a fight and is fearless – something he learnt after almost dying from an asthma attack when he was seven. “All the energy we use up in life is where we worry about what people think about us, or will I go bad or not. “I am just a person who has no concern about those things. Earlier, he confides he has found new energy after starting to use a CPAP machine for his sleep apnoea. His staff no doubt wish he hadn’t. It’s not uncommon for them to get late night or early morning phone calls or 3am text messages. “The question is that if you are going to try to do something like we try to do, you have to have that capacity,” he says, standing outside a Chinese restaurant in Sydney ahead of a 9pm Lateline interview. “It’s the task, so you’ve gotta try and measure your effort to the task. “Everybody said it was impossible to get 150 candidates to establish a new party… it couldn’t be done. Well now they know it can be done. Asked whether he ever has a day off, Mr Palmer responds: “Not really, because it is an intellectual thing when you are resting you are thinking. The trick, he says, is to reduce it to a simple format – black on gold of course – so the masses can understand it. “I tend to come up with ideas pretty regularly and different angles to look at things. “And I’ve got a fairly sharp, quick mind and that often puts our opponents in the political area to disadvantage on television and things like that. Even during his twerking session with Kyle Sandilands and Jackie O, Mr Palmer manages to get across key messages about his policies, the fact that Rudd and Abbott are afraid to debate him – because he offers new ideas and ways of doing government. Sitting in the lobby of the Hyatt in Canberra he senses a moment of boredom among the media. He declares he has a breaking story and announces plans to give Australia’s disability pensioners an extra $150 a fortnight – the same as he is offering to other pensioners. He announces taxes will be cut by 15% and says he will abolish the Fringe Benefits Tax and HECS fees for university students, while at the same time pumping billions more into Australian schools and hospitals. Mr Palmer scoffs at suggestions he should submit his policies for Treasury for costings, saying their numbers are “always wrong”. “Do you think I will go to those clowns,” he says, later pointing to the fact that he has top financial advisers for his companies from New York to London. Mr Palmer thrives on the attention, the adrenaline of the political campaign, and the thought that he is giving Rudd and Abbott a wake-up call. He is driven by a hatred of what Premier Campbell Newman is doing in his state, including the slashing of thousands of public servant jobs, the sale of assets and moves to privatise Sunshine Coast University Hospital services. Over the two days, the PUP leader varies his message between the serious and the bizarre, joking he is all about love and pie and looking after Australia’s hamsters as he does an interview on the ABC’s Hamster Wheel. “These guys are boring as hell,” he says of Rudd and Abbott’s politically correct, stage-managed campaigns. 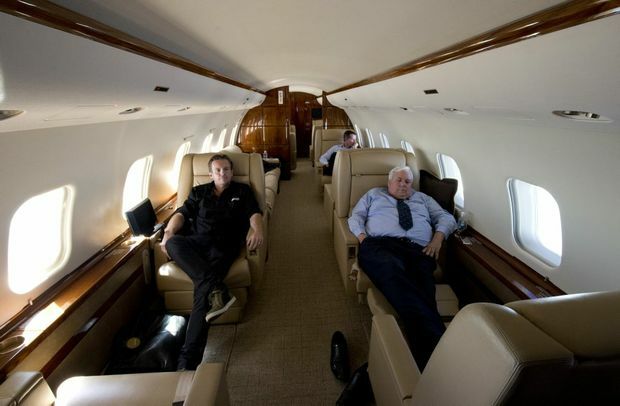 Life with Clive Palmer as PM would be anything but boring – if journos and public servants could keep up. Excellent interview with Lyndal Curtis on ABS News24. Love Clive’s response to question on how much he spent on the PUP campaign (h/t reader Kevin Moore). 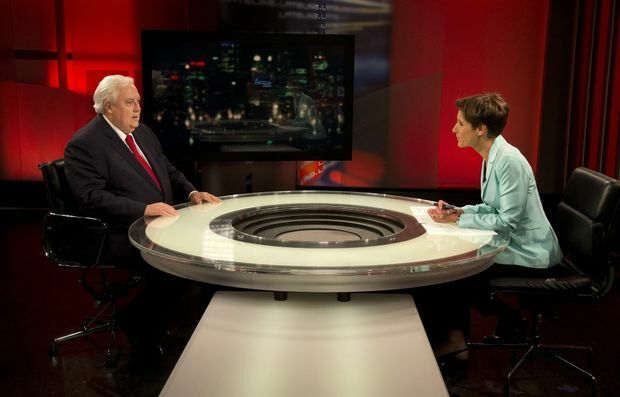 In this interview Clive Palmer’s answers disarm the ABC’s Lyndal Curtis. In fact she looked as though she quite liked him in the end. I am beginning to think “I like the boy”. 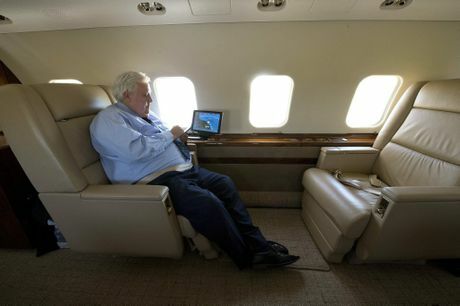 Lets see if Palmer is working for the nation or himself though and if the big hand outs are affordable. At any rate he could not do much worse than the 2 sides of politics. Really guys? This man is a buffoon. It’s like the Pillsbury Doughboy found a billion dollars in a handbag behind some train tracks. I agree that the major parties have failed us utterly – that’s about as uncontroversial and populist a statement as one could make. But what’s he actually stand for? Chest-thumping popular patriotism, and not much else. When pressed for an actual policy, sometimes he makes economic sense and then other times he comes completely out of left field by opposing Newman’s cuts to the public service. What does he stand for?! A “buffoon”, you say. Interesting. Guess that’s how he became a self-made billionaire. The crux of our success as a nation is monetary sovereignty. We are selling off our resources/energy for a song just, to have enough money for our economy to function. Money is not wealth but just the medium through which our human productivity expresses itself. Money costs nothing to produce, yet why is it so scarce in a world full of ideas and creativity? Money should be our servant, but our elites have made it our oppressive master, thus limiting all human potential on this planet. For 300 yrs we’ve been ruled by an elite of war mongering bankster criminals. It is time to end the oppression. Perhaps Clive Palmer will be the catalyst to awaken us from this stupor. Excellent comment … nicely summarised.